A 74 unit true historic preservation and adaptive reuse of 1923 vintage warehouse and office buildings unique in all of Atlanta. Most parking indoors and under roof. High security with limited vehicular and pedestrian access controlled electronically and surveilled by electronic camera network. A diverse mix of units ranging from 680 s.f. one-bedroom units to 1500 s.f. two-bedroom, two bath units. Includes, flats, town homes, up and down lofts, penthouses. No two are alike. View our floor plans. Highly energy efficient including up to 90% reduction in energy usage and utility costs through individual unit metering, over-sized walls with blown cellulose insulation, double-glazed windows with low-E glass, Energy Star appliances, high SEER HVAC units with mini split ductless heat pumps and elimination of all ducts, all LED lighting, low-flow plumbing fixtures and more. Exceeds the standards of the Federal Energy Efficiency tax program and Georgia Power Company. Green, sustainable certification by Southface/Earthcraft due to recycling/reuse of historically authentic building features and components. First multi family project to win this certification. Historic authenticity meeting the criteria of The Georgia Trust, the National Park Service, the Atlanta Urban Design Commission and the Georgia State Historic Preservation Office. 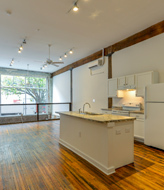 Excellent location in downtown Atlanta within the Castleberry Hill Landmark District, designated by USA Today and The New Yorker Magazine as “One of the 10 Hottest Art Districts in the U.S.,” surrounded by over 20 galleries and home of the monthly Castleberry Art Stroll. Here we are on the map. Accessible transportation just 20 minutes from the Hartsfield-Jackson International Airport (busiest in the U.S) and a few blocks from the intersection of Interstates 20,75 and 85—the transportation center of Georgia. MARTA bus and rail service are within walking distance. A “town square” atrium within the property for meeting and socializing, surrounded by the fitness center, club/party room and kitchen, common area laundry and other features. Many units equipped with clothes washers and dryers. Furniture-grade kitchen and bathroom cabinetry. 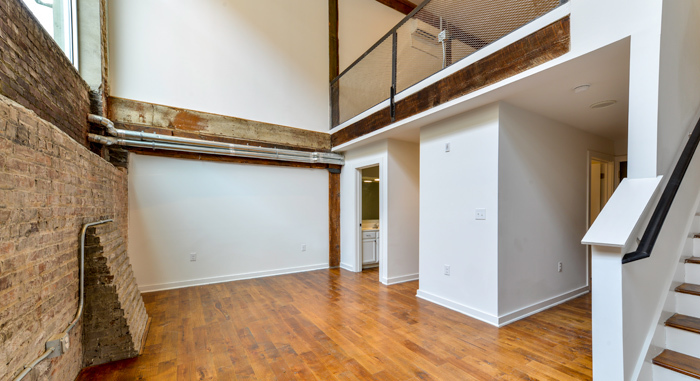 True loft design with high ceilings (up to 20 ft.), open floor plans, great natural window lighting, original refinished pine floors, original 16 in. 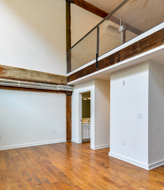 heartwood pine beams and columns, original brick and granite stone walls, and more. Tenant storage lockers for the stuff you want to keep but don’t need in your living space. High-speed broadband fiber optic and coaxial cable Internet, streaming and cable TV service from ATT and Comcast. Free Wi-Fi service in clubroom and lower atrium area. 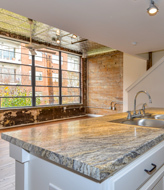 Your home could have been featured in one of the many movies filmed at Fulton Supply Lofts! We are within a walk or a short drive of The New Georgia Dome, Philips Arena, CNN Center, Olympic Park, NCAA Football Hall of Fame, National Museum of Civil and Human Rights, World of Coca Cola, Georgia Aquarium, Children’s Museum, Ferris Wheel, Street Car, Russell Federal Building and Courthouses, MLK Federal Building, Georgia Institute of Technology, Georgia State University, Atlanta University, Fulton County Offices, Atlanta City Hall and Offices, State Capitol and Offices, and scores of restaurant, hotel and entertainment venues. 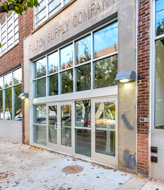 We promise that, when you live at the Fulton Supply Lofts, you will live in a truly unique home that will be the envy of your friends and family!